In addition to the numerous anomalies found on the surface of the moon, UFO Hunters have found a set of mysterious tunnels visible on satellite images of the moon that have eventually been brushed away. What are ‘they’ hiding? Near the landing site of the Apollo missions, UFO hunters discovered a set of tunnels stretching up to one kilometer in length. The enigmatic ‘tunnels’ were found by UFO hunter Marcelo Irazusta, near the Apollo 17 landing site. 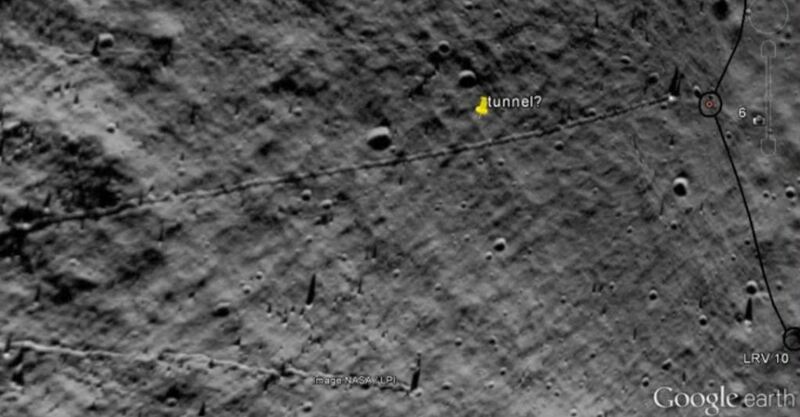 Interestingly, these tunnels appear to have been brushed away in newer versions of Google (Earth) Moon, which has raised speculation as to what is really down there, and why have the ‘mystery tunnels’ been removed. In the past, UFO hunters from around the globe have discovered countless things that should not be on the moon. However, if these alleged tunnels are just fissure marks on the surface of the moon, why have these ‘faults’ been brushed away in later versions of the satellite images of the area? In addition to tunnels and strange marks, UFO hunters have found what appear to be domes, towers and strange lights, all visible on Satellite images on the moon and Apollo mission image archives. Not long ago, a NASA whistleblower released a set of images from the Apollo missions which are considered as the ultimate proof of alien bases on the lunar surface. The images from the private collection of Ken Johnston –who is well-known in the UFO community for stating there are things on the moon that shouldn’t be there—appear to depict Alien bases on the surface of the moon. During his time at NASA working on the Apollo missions, Ken Johnston came across some images taken by NASA astronauts during the Apollo missions to the moon which show what seem to be alien bases on the surface. NASA’s Apollo 8 mission is one of the most famous manned missions to the moon and was the first time human beings travelled to the moon. Interestingly, a set of images and videos from the journey to the moon indicate that the astronauts might not have been alone in space. Interestingly, the black and white image taken by a 70mm camera was the ONLY surviving sequence of the film fro the Apollo 8 mission that shows the object. But different images, satellite images and videos from the moon have ignited a worldwide debate in the UFO community in recent years. In the last five years, countless anomalies have been discovered on the moon, which has been backed up by numerous statements from government officials, former astronauts, and highly ranking military personnel. For example, George Leonard, A NASA scientists in charge of photo analysis obtained several extremely ‘controversial’ images from the Moon, published in his book called Somebody Else Is On The Moon. What do you think? Are the above images and videos proof of ‘secret tunnels’ on the moon? Or is there a more rational explanation like natural faults on the lunar surface that could explain the anomalous shapes on the moon?